BTT Homes is a luxury hotel located at Plot 5 Theophilus Orji Off Fola Osibo, Lagos, Nigeria. The hotel is known for its proximity to Lekki Leisure Lake and Elegushi Royal Beach. It is located in the city center. Rooms in BTT Homes are divided into categories which are Standard Room, Deluxe Room, Premium King, One Bedroom Apartment, King Deluxe, Executive Room and Executive Suite with Balcony. The Executive Suite has a balcony overlooking the beautiful landscape of Lekki. 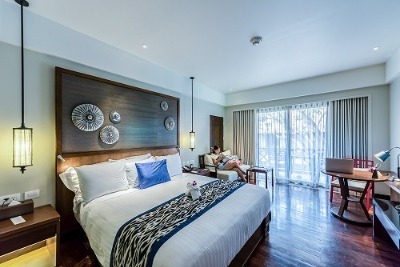 Each room features an LCD TV with cable connection, air conditioner, king sized bed, a sofa, a wardrobe and a dressing mirror. The bathrooms are spacious and it comes with a bathtub. There is a bar onsite where guests can go to have a cold bottle of drink. The bar has a variety of alcoholic and non-alcoholic drinks. BTT Homes also has a restaurant which serves variety of local and continental dishes to make sure guests never run out of options. This is a popular destination for families on vacation and couples on honeymoon. It is relatively cheaper than other hotels in this category. Q: What is the check in and check out time at BTT Homes? A: Check in is from 12:00 pm while check out is by 12:00 pm. Q: Does BTT Homes have a restaurant? A: Yes, the hotel has a restaurant. Q: Does BTT Homes have an event centre? A: No, BTT Homes does not have an event centre. Q: Does BTT Homes offer airport pickup or shuttle services? A: No, the hotel does not offer this service. Q: Does BTT Homes have a reward programme? A: No, BTT Homes does not have a reward programme. BTT HOMES is a budget hotel in Lekki Phase 1, Lagos. Have nice pictures of BTT HOMES?